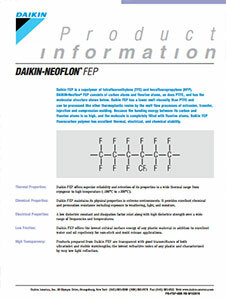 NEOFLON™ FEP NP-102 by Daikin is a perfluoroethylene propylene (FEP) copolymer of tetrafluoroethylene (TFE) and hexafluoropropylene (HFP). Exhibits resistance to weather-, chemicals-, moisture-, light-, flame- and permeation. Provides high performance, lower melt viscosity and high transparency. Shows non-sticking properties, electrical reliability, low reactivity, low critical surface energy, chemical- and thermal stability. Possesses low dielectric constant, dissipation factor with high dielectric strength over a wide range of frequencies and temperatures. Suitable for injection molding of thin wall parts and high speed extrusion processes. Recommended for tubes, small parts, wires- and cable coatings. NEOFLON™ FEP NP-102 complies with FDA 21 CFR.177.1550, ISO-9001 (Quality System), ISO-14001 (Environmental System) and Responsible Care 14001 (Safety, Health, Environment and Security).